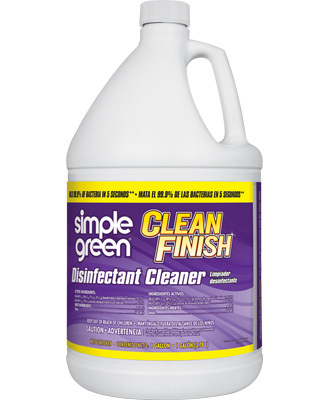 Simple Green Clean Finish Disinfectant Cleaner's ready-to-use formula outperforms many competitors in both disinfecting power and speed. The EPA registered, broad spectrum formula disinfects up to 20 times faster than other popular brands, which often require surfaces remain wet for up to 10 minutes. Simple Green Clean Finish kills 99.9% of bacteria in just 5 seconds, and is effective against 14 more pathogens that popular brands don't kill, including antibiotic and drug resistant superbugs like MRSA. The formula works quickly against rapidly spreading germs such as the Cold and Flu, Salmonella and E. Coli. It's also bloodborne pathogen compliant for use against HIV-1, Hepatitis B and C and others.